A paid mercenary, is he? Not one of those freelance pro bono mercenaries you're always hearing about? How fancy! This Sabretooth is built on the big body, same as the Wolverine Legends figure, but he's wearing the superior Jim Lee costume. It's hard to drastically redesign a comic character's costume and have people embrace it, but Lee managed. The suit is brown and orangey-yellow, with a big stripe down the center and tiger slashes on the biceps and thighs. Like his original costume, he's got a thick pad of fur on his shoulders, but the sides no longer meet in the middle. The toy gets new forearms, so he can have his traditional 1990s elbow-spikes. The head is new, as well. While the unpopular and short-lived costume the last toy was in also had one of those '90s-style head-socks, that Sabretooth had a full beard and longish hair - this one just has the fuzzy burnsides muttonchops and the short hair (though this costume was also drawn with long, Tyler Mane-inspired hair), and his mouth is open in a great lopsided growl. 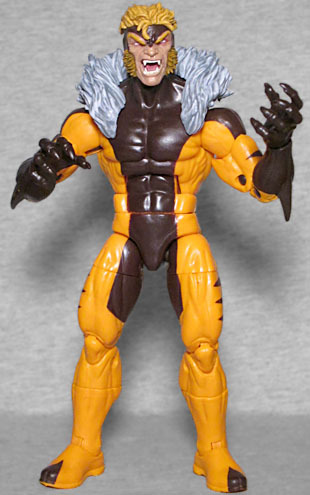 Though the fur collar is a separate piece that plugs into the toy's backhole, we wouldn't really count that as an accessory; thus, the only pack-in Sabretooth comes with is the left arm of Apocalypse, this series' Build-A-Figure. While Victor Creed has had about half a dozen different costumes since this one, he keeps defaulting back to it (or small variations on it) any time he goes without appearing for a while, so this figure is a welcome new release! However, if you prefer a unique sculpt (and a larger size), you're better off with the Marvel Legends 5 figure. This entry was posted in blog exclusive review, Hasbro, Marvel and tagged Marvel Legends, X-Men. Bookmark the permalink.